As our loyal pets and friends, many of those of us who have dogs like to take them with us wherever we go. It’s an open debate about whether this should include bedtime but, as all dog owners know, it’s one of the most tempting places for our companions to want to join us. No matter their size, there’s something really appealing to them about the bottom of the bed by our feet, but is it really a good idea to allow this to happen? In this article we will be looking at the pros and cons of letting your dog sleep in your bed with you. It’s actually quite a common practice for people to let their dogs sleep in bed with them. A survey by the American Pet Products Association recently revealed that almost two thirds of small breed dogs, two fifths of medium breed dogs, and a third of large breed dogs do so on a regular basis. 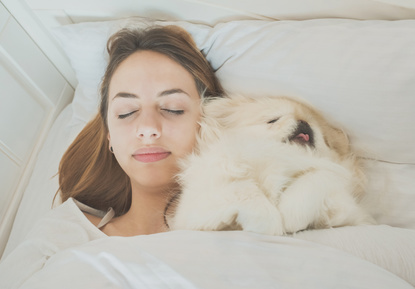 Other studies have suggested that about 79 percent of pet owners let their animals sleep with them (usually dogs or cats) so it’s quite a normal behavior. From your dog’s perspective, being able to sleep in your bed with you is a massive compliment and confirms them as being a part of the pack. They will feel safer and more secure by being able to sleep in the same area as you as opposed to being in a different room, and it will help to improve your overall relationship. The occasional movement and noises can make the bed an even more comfortable place for owners. We all love our dogs to bits, so having them nestling at our feet can help us to get a better night’s sleep too. Having your dog in bed with you is like having a living hot water bottle. This might not be the best thing in the warmer summer months, but in winter they will share their body warmth with you and keep you both feeling more comfortable. The presence of dogs have also been shown to significantly improve your state of mind by providing antidepressant, stress relieving, and calming effects. They cause neurotransmitters to be released into your brain that encourage relaxation, and have also been shown to help lower blood pressure. If you struggle keeping to a routine when you sleep, your dog could be the answer to your problems. They will likely wait up, or at least wake up and follow you when you go to bed, but they will wake up at a similar time in the morning and will soon help you normalize your own sleeping habits. If you are someone who suffers from allergies, then sleeping with your dog in your bed could be a bad idea. In fact, they probably shouldn’t ever go in your bedroom at all. This is because you spend a large proportion of time in bed and will ideally have nothing in the room that can trigger your allergies so your nose has some recovery time. You should only let your dog sleep in bed with you once it has been trained properly to be able to sleep on its own wherever its bed is. The problem with letting them sleep in bed with you all the time is that they may develop a need to do it, so on those times when you aren’t around they will struggle and be unable to sleep. While dogs can have a calming effect that helps with sleep, the opposite can be true as well. This can happen if your dog snores, kicks in their sleep, or even simply tries to take all the covers to itself, and these behaviors can have a significant impact on the quality of sleep you get yourself. Quite often sleep therapists will see patients with insomnia and find no reason at all why they are experiencing problems with sleeping, until they find out that they share the bed with a dog that scratches and twitches all night long. Dogs like to explore those parts of the world we aren’t so keen on ourselves, and can potentially bring the germs and dirt from the outside into your bed. There is, therefore, a slight chance of the transmission of illness from your dog in bed. There have been confirmed cases of people catching MRSA and influenza from close proximity to dogs, and you may also find that they bring bugs, like fleas or ticks, into the bedding too. While this is an always present, but minimal, risk, you can take steps to reduce the likelihood by regularly bathing your dog, ensuring that they are treated for fleas and ticks, and have frequent visits to the vet to make sure they are healthy. Dogs are wonderful companions to have in life and, with their reliance on us for everything in their world, it seems only natural to want them to sleep in your bedroom or bed with you. Most pet owners let their dogs sleep with them occasionally and, while there are some slight health risks, it is perfectly safe as long as your dog is healthy. Those with allergies may want to avoid it, though, just so they can have clear breathing throughout the night, but otherwise you’ll find that your dog sleeping in bed with you will make you feel happier, sleep better, and improve the relationship you have with your best friend.